We've received a lot of great feedback on our brand-spanking new Marketing Calendar – a handy tool that helps you plan your activities and collaborate with other campaigners. Here’s a few updates that you might find very useful. Users with Business tariffs are now allowed to create an unlimited number of additional calendars. This update will come in handy if you, for example, own an agency serving a great deal of clients. In order to prevent unplanned changes, we have added the ability to invite collaborators with read-only access permission. This feature is also available for users with Business tariffs only. The editing function is disabled for read-only collaborators, but they can add comments to Campaigns and Activities. Always be in the loop! We have added the ability to choose the types of notifications that you can receive by email and that can be displayed inside the Calendar. You can find this section in the Settings menu. Another convenient feature: the ability to set a status for your activities. Currently, there are three statuses to select: ‘In progress,’ ‘Requires approval’ and ‘Done.’ You can set your status in the activity window. That's the news for now. 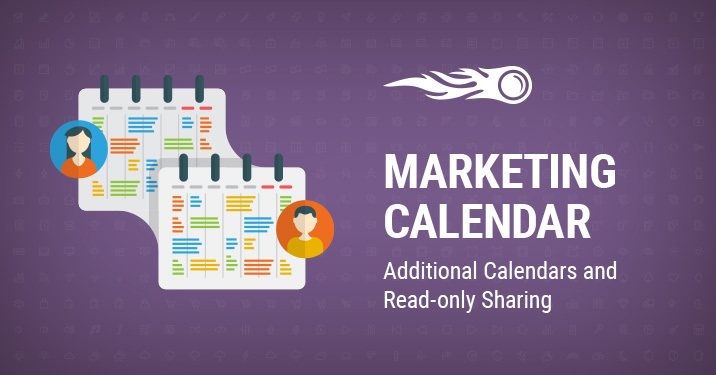 In case you’re new to our Marketing Calendar, learn more here. Don’t hesitate to send us your thoughts and suggestions at [email protected].